Welcome! I'm a PhD Candidate in Political Science at Stanford University. 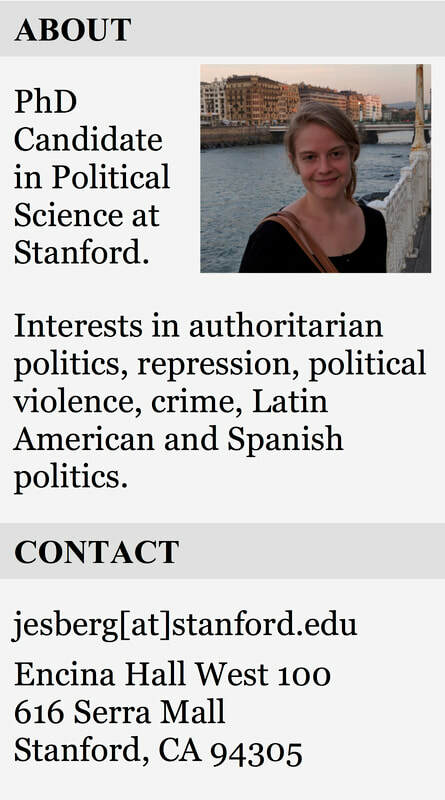 My research centers on authoritarian repression, with a focus on historical dictatorships in Latin America and Spain. In my dissertation, I use new micro-data on political killings, detention, exile, search and seizure, and pop culture censorship to understand variation in the targets and tools of repression during the Pinochet dictatorship in Chile (1973-1989). Results demonstrate that repression served not just to eliminate opposition, but to appeal to supporters. I am a Stanford Interdisciplinary Graduate Fellow and Dissertation Fellow at the Institute for Research in the Social Sciences. I was previously a fellow at the Center for Ethics in Society. My research has been supported by a Graduate Research Opportunities Award, the Freeman Spogli Institute, Stanford's Center on International Security and Cooperation, the Stanford Center for International Conflict and Negotiation, and the Europe Center. Before starting graduate school I worked at the NYU Center on International Cooperation as a program officer. I have a BA in International Relations with Honors in International Security Studies, also from Stanford.